When Liverpool Community Health NHS Trust planned to move its headquarters from Wilkinson Place, Wavertree Technology Park to LIP the decision was made to make the new headquarters as environmentally friendly and efficient as possible. 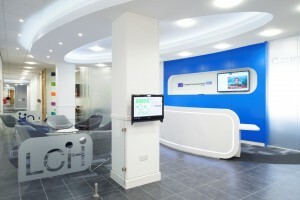 Working with ADT Workplace and ADT Energy the standard chosen was the SKA Fit Out for Offices Sustainability Assessment. Featured in the UK Government’s Low Carbon Action Plan, SKA rating is an environmental assessment method, benchmark and standard for non-domestic fit-outs, led and owned by RICS. SKA rating helps landlords and tenants assess fit-out projects against a set of sustainability good practice criteria. It is estimated that 11% of UK construction spending is on fit-outs and that buildings may have 30-40 fit-outs during their lifecycle. As each fit-out project is unique in terms of employers’ requirements, the building or site, and scope of works, SKA Rating scores the project only on the basis of those measures that are relevant to the project. These are called ‘Measures in Scope’. Typically, between 30 and 60 measures are likely to apply to most projects. The score is ranked in three thresholds: Bronze, Silver and Gold. These thresholds are reached by achieving 25%, 50% or 75%, respectively, of the measures in scope. Some measures are more important from a sustainability perspective, so the measures are ranked from 1 to 112, (1 is the highest and 112 the lowest). To ensure that teams do not just target the easiest measures, the project has to achieve a number of the highest ranked measures in scope in order to score.